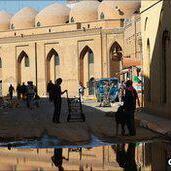 A series of car and suicide bombings mainly in Shia areas in and around #Baghdad killed about 60 people on Tuesday. Markets, restaurants, bus stops and day labourers were all targeted during the morning rush hour. The attacks came on the day which also marks the tenth anniversary of the US led invasion of #Iraq, a day when people are naturally reflecting on the war and it's consequences - and trying to look forward to the future. Ali Nima is a student in Baghdad. We asked him for his thoughts on how Iraq has changed since 2003.